RG will dismiss it with a wave of the hand, sort of like Lady Grantham after looking at one of the new-fangled "greeting cards" at Downton -- the incomparable Maggie Smith and her facile wrists. But don't let that stop you . . . ! Don't know anything about the seller -- but it's a far lower price than anywhere else online, so far . . .
Hardbound copy at AbeBooks and elsewhere, $301, is damaged . . .
Tom, if you want to learn about gothic architecture, first read Henry Adams "Mont-San-Michel and Chartres," especially on the evolution of the famous gothic arch. But if you are hesitant to part with the cost of Storrer, you probably should look for the Adams book at your local public library. SDR, Storrer was very dissatisfied with the quality of the plans in his book. He was hamstrung by a cheap computer system provided by his publisher. But, as with Madeleine Thatcher of HB, the clear, simple drawings of Storrer's book are very helpful in getting a basic understanding. Another book on gothic architecture is "Monastery & Cathedral in France" by Whitney S. Stoddard. He posits the idea that the gothic arch came about accidentally in Romanesque architecture. Where two tunnel or barrel vaults intersect, a groin vault is created. When the concomitant outlines of a groin vault are emphasized by ribbing, an illusion is created by viewing the ribbing from an angle which makes it appear to be a pointed arch. Voila! The lenticular or hemicycle plans fall into two distinct types based on their plan unit geometry. The Laurent house derived plan types use an orthogonal unit, and the Jacobs II derived plans use a radial unit. So, we have Wright mixing it up, trying different combinations of plan shapes and grid patterns -- as I guess we would expect ? The Laurent, Winn, Pearce, Rayward, and Spencer houses all have concave window walls with convex terraces and per my understanding of the H and L designations, should all be H's. Winn may be a special case in that it has a concave window wall, but its elevated terrace is enclosed with a roof and a convex screen wall (in effect a skylighted screen porch). As seen in Mono 8, Marden began with a concave window wall, but I suspect it was flattened in later design iterations to allow more useable/furnishable floor area in the circulation space to take advantage of the spectacular view of the Potomac valley. Well, it appears I screwed that one up royally. I shall go back and edit my posts. they are unique. It was the lenticular plans that I sought to separate from the hemicycles . . . The chronological listing I take from Storrer. Presented in the (non-chronological) order he shows them, the list neatly begins and ends with the hemicycles, with the two lenticular ones falling two-thirds of the way through the group. So, per Dan's lists, all the orthogonal-grid houses are "hemicycles" -- or, at least, they all have concave glass. The radial-plan group is mixed, in that respect . . . There you have it, DNR, almost all of them are indeed Aches, with only a couple of Ells. But I object to the term "lenticular"; it sounds "cuisinical." What word do you prefer to use, to specify the plan shape of the L Wright and Lewis pair of designs ? Lenticular surely is not inaccurate -- no matter the unintended food-based association ? The concave/convex pairing of the window wall and a reflected terrace seems to be a trait of the orthogonal unit based plans. The radial unit plans often have an anchoring circular masonry element usually containing utilities, whereas the orthogonal unit plans have orthogonally based masonry anchoring elements. 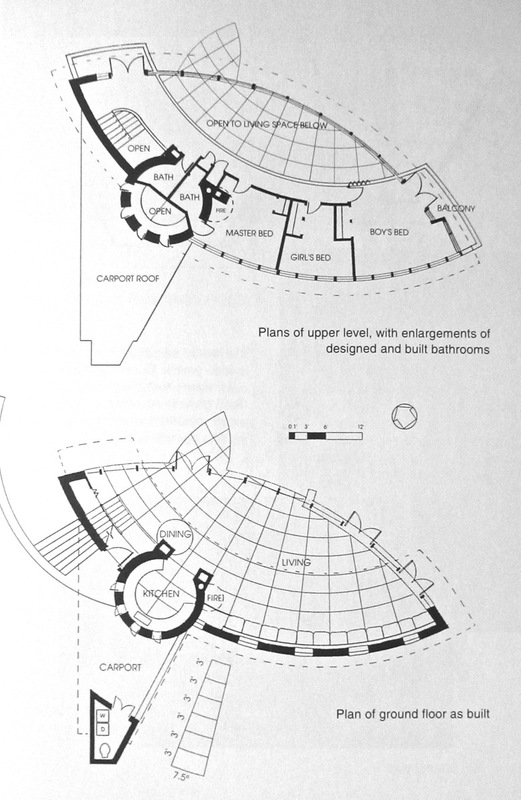 The David Wright house, thought not functionally a solar hemicycle, shares several design elements and geometries with the radial unit plan type. The Kaufmann Boulder House may be a mash up of the two systems...its grid is not clear per the plan, but it does seem to be organized by a center line and back to back right triangles extending from the center line. Thank you; that's a much more useful description of the situation than the overly simplistic tag of window wall plan shape. Any commonalities are to be grasped like a lifeline, when encountering a novel phenomenon . . . ? terminals in plan, seems a pleasant place to be. me to be much affected by the shapes of the glass planes they penetrate. 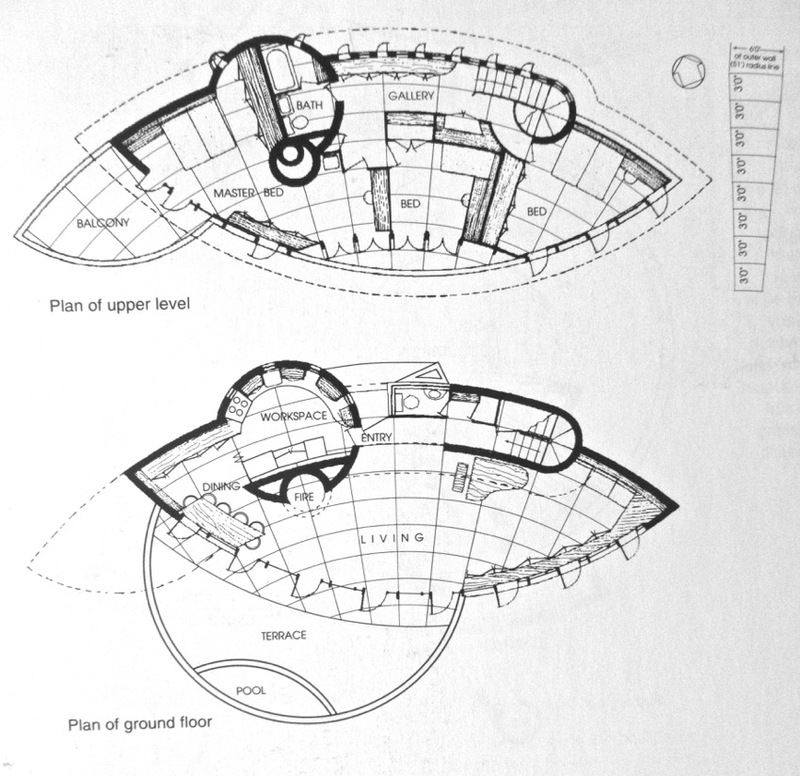 Does the interior atmosphere actually benefit from the curved nature of the plan ? unit at the large end of the wedge. The Lewis plan is related to Jacobs II . . . Does the interior atmosphere actually benefit from the curved nature of the plan ? I have noticed that Wright's deep structural mullions, coupled with the relative thickness of his wood sashes cast considerable shadows as the sun shines at increasingly oblique angles across the Sweeton walls of windows later in the morning. My observation at the Spencer house is that those shadows are reduced with the combination of wider stationary windows and the facets of the wall rotating in plan to allow a portion of the window wall to have a less oblique orientation for a longer stretch of the day.